A broad slab of wood lashed to the top serves as a seat, allowing the Abu Zeid to row a few hundred meters out from shore -- far enough to go fishing. It takes him about eight hours to pull in between five to seven kilogrammes (11 to 15 pounds) of sardines, mullet and other small fish with his rod. He sells his catch to passersby on the nearby corniche, making between 20 and 40 shekels ($5-11, 4-9 euros) a day. Muath's two younger brothers -- Mohammed, 23, and Ashraf, 20 -- accompany him on his daily excursions. Neither were able to find work elsewhere. "I'm a house painter but because of the difficult situation I'm unemployed," said skipper Muath, a descendent of refugees from a village near Jaffa in present-day Israel. "So this boat has been a lifesaver for me and my family." 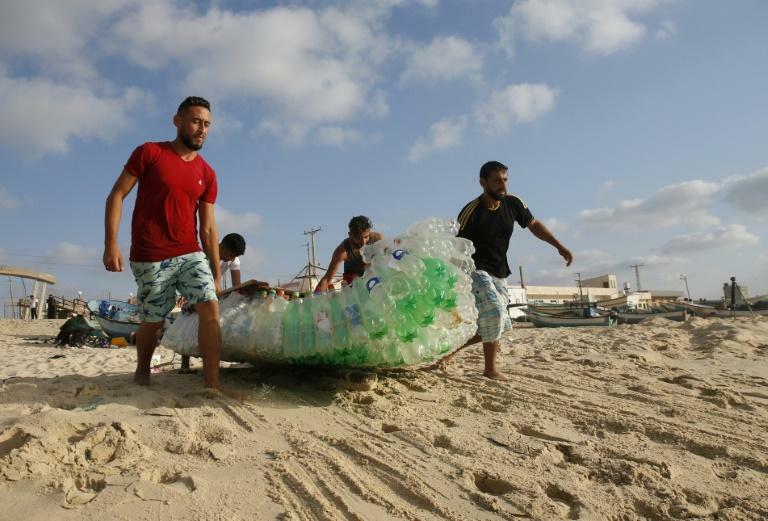 Under a crippling Israeli blockade more than a decade, Gaza suffers 44 percent unemployment, rising to a "staggering" 60 percent amongst the young, according to 2017 World Bank figures. The coastal enclave's electricity crisis means sewage is often pumped directly into the sea, leaving its 40-kilometre (25-mile) coast line heavily polluted. 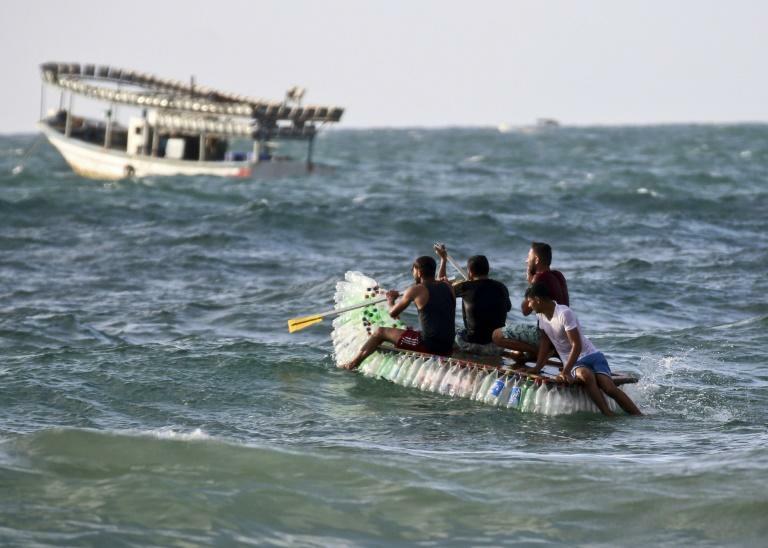 Yet many in Gaza depend on fishing for a living, despite Israel enforcing a fishing zone limited to nine nautical miles in the south of the enclave and just six nautical miles in the north, near Israel. 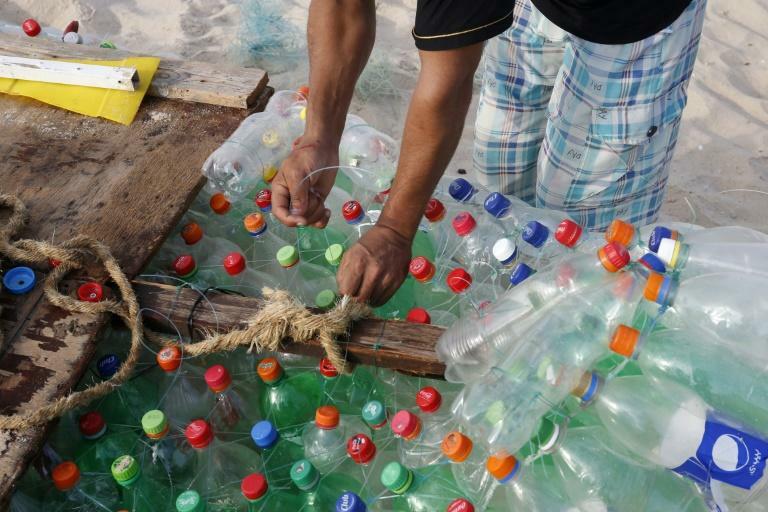 Muath picked up the idea for the boat on YouTube, where he saw hobbyists designing boats using plastic bottles discarded by holidaymakers on beaches. "I appreciated the idea and said to myself, why not preserve the environment and create a living for me and my family -- and that's what happened," he said. He hopes to buy a fishing net soon, "so that I can pull in larger amounts of fish, sell them and live a decent life". The craft is fragile and he's hemmed in by the frontier with neighbouring Egypt, but he says the waters along the border have plenty of fish waiting to be caught.